The passion for their profession has been passed down through generations for more than 200 years to Tom Clark, 29, who now co-runs Pitlandie with his father and uncle. And it certainly is a family affair as Tom’s 95-year-old grandfather still keeps a hand in on their four-farm enterprise, after spending more than eight decades in agriculture. 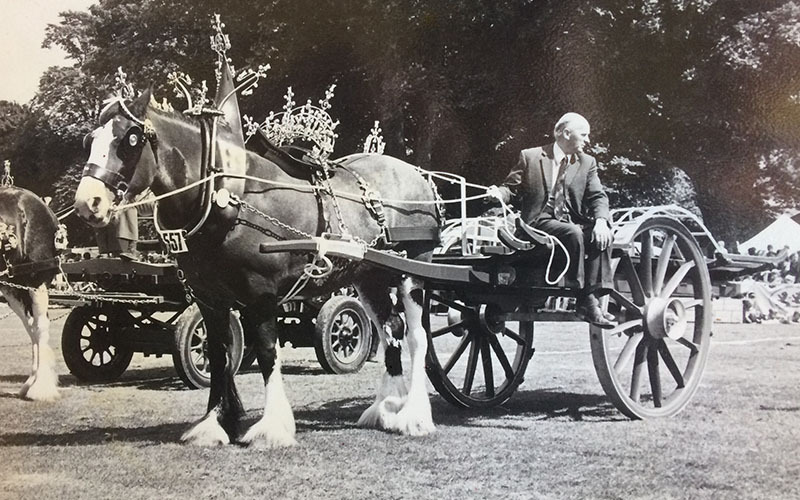 When Tom’s granddad also Tom (pictured above) first started in the industry, work horses were used before they were replaced with tractors during the mechanisation of Scotland’s farming in the 1940s. Since then there have been huge changes in farming; but one thing that has remained constant at Pitlandie is animal welfare, something that has been held in high regard throughout the generations. This is one of the reasons why they are Scotch-assured cattle farmers under the Quality Meat Scotland (QMS) scheme which offers consumers a guarantee on welfare and production standards. It’s a labour of love for Tom, who begins most days at 6am. He’s always had a love for the countryside and says he enjoys the ability to grow something and get satisfaction out of the end product. 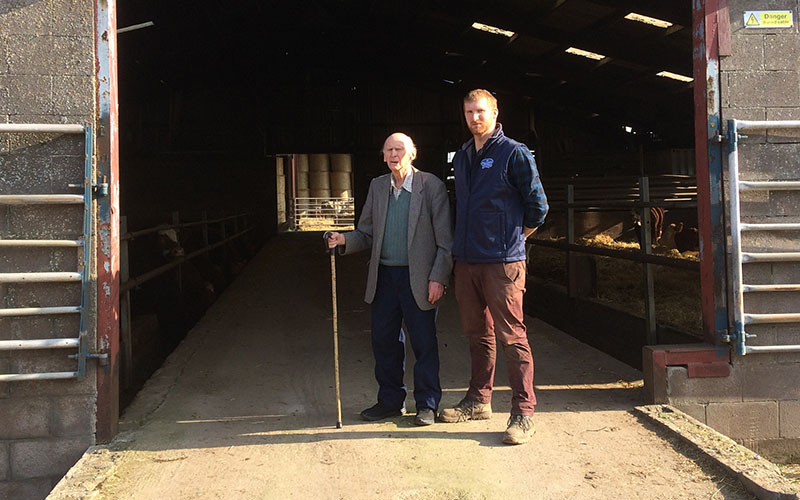 Tom, pictured above with his grandfather, added: “To be able to have such a good quality product at the end of the day reinforces all the hard work you put in to get there – sleepless nights during calving, planning grazing systems and feed rations. It makes it all worthwhile. “Farming is a real passion; you’ve got to have a love for what you do to get you through the hardest times. “We are up in the mornings for the 6am feed, then the day really gets going a couple of hours later with tagging calves, weighing our store animals, maintaining fencing and looking after the crops. We have just started calving, so we run a maternity ward on site, where we are the midwives. 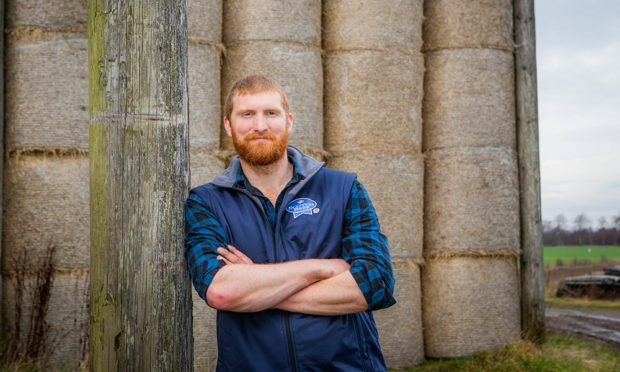 It’s Tom’s commitment to animal welfare standards and passion for producing quality Scotch Beef that has made him an ideal ambassador for the latest QMS Scotch Beef campaign. Currently at Pitlandie there are 90 suckler cows which spend most of their life on pastures at the Perthshire farm. Although they mainly feed on grass, Tom also supplements their diet with other rations that are grown on the Clarks’ mixed arable farm. 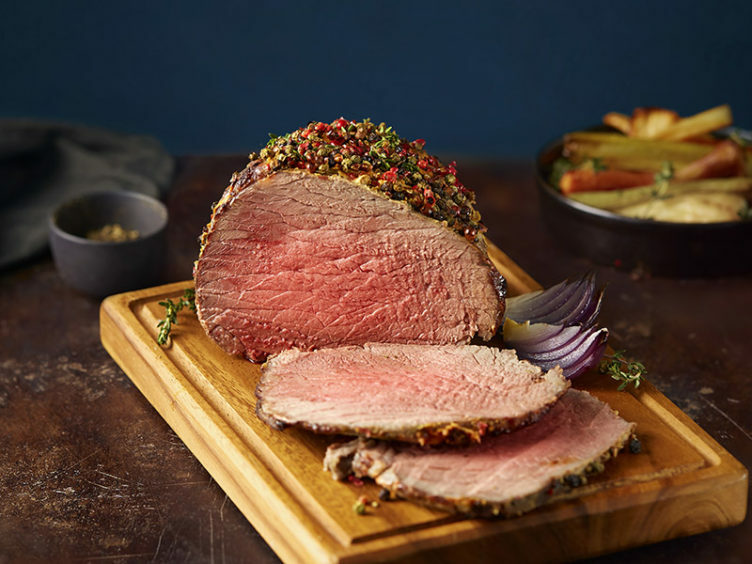 “Scotch Beef, with all its quality assurances and guidelines, as well as the wealth of knowledge shared across the industry, makes it the best in the world and I really do believe that,” Tom said. Rib roast: This is my favourite cut. It has a lovely marbling effect. If you speak nicely to your butcher he can cut it up to any size or portion. To cook, just simply rub it in crushed garlic and stick it in the oven for a couple of hours. Beef mince: As a modern man, I like something that is quick and easy, and Scotch Beef mince is so versatile. Just throw it in the pan and it makes a spaghetti bolognese. Add red wine to encourage the flavour. If you are making chilli, my tip would be to add a dollop of honey. Steak strip pizza: When I find the time, a homemade pizza is a favourite. Have it any way you like it but a steak cut against the grain – in the opposite direction to the meat fibres – will steal the show as a pizza topper. A winter-warming beef and beer pie: For a twist on steak and ale pie, this beef and beer pie is made with feather-blade steak, a little Worcester sauce and a can of good local dark beer. *For more about Scotch Beef, visit the website by clicking here.